Termites are a group of asocial insects.While termites are commonly known, as “white ants,” they are only distantly related to the ants. Termites divide labor among castes. Termites mostly feed on dead plant material,, generally in the form of wood, leaf litter, soil, or animal dung, and about 10 percent of the estimated 4,000 species are economically significant as pests that can cause serious structural damage to buildings, crops or plantation forests. Termites are major detritivores, as asocial insects, termites live in colonies that, at maturity, number from several hundred to several million individuals. Subterranean termites are ground-inhabiting, social insects that live in colonies. A colony of subterranean termites may be up to 18-20 feet below the soil surface to protect it from extreme weather conditions. The mature termite colony has three castes: reproductive (king and queen), soldiers, and workers. Moisture : is critical to termite survival because all castes except the swimmers are soft sure to dry air. As such termites construct tubes when they pass over exposed areas. Termite tubes serve to (1) conceal the termite (2) provide the termites a moist environment, and (3) Protect the termites from their enemies. 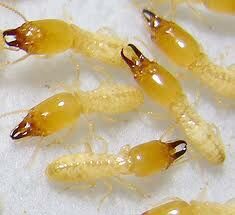 Feeding : termite have preferences in the type of wood they will eat. Termites working in the wood facilitate decay by increasing the moisture content. Thus termite damage is usually associated with decaying wood. Mud looking material an wooden surface. Termite wings but can be pass but needs an inspection. The real thing if you see termites flying in the property then you should check closely. Although termite feed on wood they actually rely microscopic organism called protozoa in their gut to digest the cellulose, the basic component of wood .colony workers who forge for food bring back to the nest where they secrete material from their mouth and an use to feed. A family of chemicals approved for trenching and injection treatments are the pyrethroids .these insecticides repel termites so they act as a barrier Imidacloprid and CPP are two additional insecticides that control termite but are not repellents termite get the chemical on their bodies and carry it to the colony queen, once the insecticides kill the queen the entire colony dies. We provide warranty as per treatment plan taken by customer and depend upon feasibility of treatment. If you are planning to build a house or develop your property for building your office, termite control is the first thing you should think of. PEST CONTROL SOLUTIONS professional. We are using advanced techniques for treating the termite infestation problem and standardized method. In Pre Construction we have two options for treating termite infestation. Porous Pipe Method is latest method of treating termite infestation problem. Porous pipes is membrane through which pesticide, insecticide, and termiticides can be uniformly is charged into soil/sand and foundation of building. We can installed during Pre construction or renovation.